I've long enjoyed the Velorution blog and this post reflects something that's been on my mind the past few weeks. Watching a little of the Olympics the past couple of weeks, I was also turned off by the nationalistic fervor. Sports should be about individual athletes, not countries. Speaking of countries, I'll be at Eurobike, in Germany, next week. We have the Grand Cru Jockey Wheels in stock. 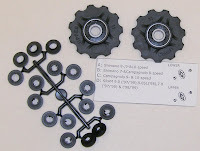 These have sealed bearing and shims to fit most derailleurs, including old Simplex models. 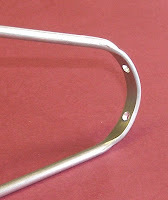 We also have a new version of our chrome plated chain guard. This one lacks the integrated mounting bracket so it can be used with traditional chain guard hardware or on custom frames that have brazed-on chain guard mounts. Also, we'll be closed for labor day. Many of you have asked for a simple all silver polished threadless stem; well here it is. It's light, has a very nice finish, and a four bolt face plate. 7-degree drop/rise. The VO threadless stem adapter allows you to use this, or other threadless stems on a bike designed for a quill stem. The advantages include the ability to use commonly available stems with a variety of rise angles. Threadless stems also have removable face plates, so bars need not be "stripped down" when switching bars or stems. 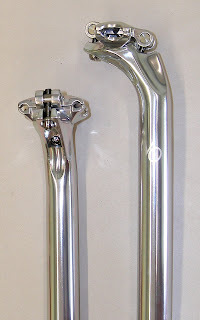 The adapter fit in a regular 22.2mm fork and work with a 1-1/8" (28.6mm) stem; 190mm length. We really like the shape of the particular design. I've gotten a lot of questions about the long awaited VO seat posts and I have good news and bad news. The good news is that the seat posts have arrived and they are everything we'd hoped for. 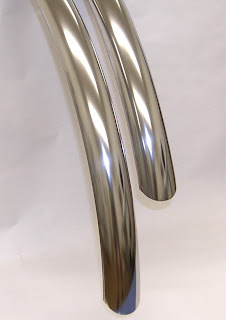 They are a gorgeous polished two bolt design. They have 30.8mm of setback, among the longest ever. This is very important for those who ride Brooks saddles which have very little fore-and-aft adjustment due to the short rails. The VO posts are internally ovalized to reduce weight to 254gms for the 300mm version. The adjustment is from the bottom and the two bolt design makes it easy to precisely adjust the seat angle. Also note that the head is integral with the post, not pressed on as on many modern posts. This makes them stronger and lighter. 27.2mm only. $45. So what's the bad news? For technical reasons the first production run was cut short. So I imagine that we'll soon run out. And production won't re-start until October. Get them while you can. 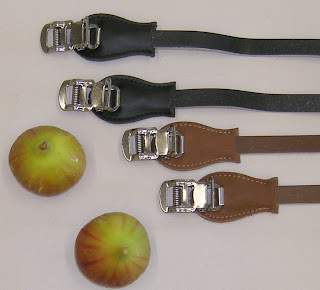 Do you remember this post about toe clip straps? Well they have just arrived, along with several other new VO components. The VO straps are available in black and in brown. They are a full 445mm long for large American feet, or about 35mm longer than most European straps. The buckles are stainless steel. They include buckle pads to prevent scratches on your shoes. Figs not included. We also have some new track pedals. 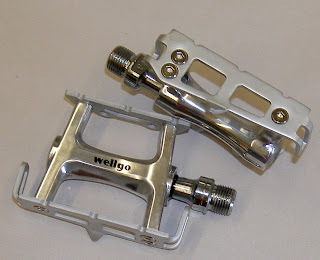 These are made for us by Wellgo, the large Taiwanese pedal manufacturer. There are some versions of this pedal already available and we really liked the look and quality of it, especially of the Japanese market version. So we asked Wellgo to try to make a version that was as nice as the top-of-the-line Campy and MKS pedals. The VO/Wellgo pedal has high quality sealed bearings, is hand polished, and has lovely satin finished cages. I'll be writing about the newly arrived VO seat posts, VO stems, VO stem adapter and VO universal cartridge bearing jockey wheels soon. And we have Grenluille brakes again, but now they include cartridge-style brake shoes. The photos are of the new versions of the VO Baguette and Croissant bags. They will have real leather piping and a few new features. But they are still 4 months out. Our final prototype of the VO handlebar bag was shipped today and should arrive in a week or two. I'm feeling pretty good about it. I think we, and the factory, have finally nailed it. Now to get it into production. No point in resting on our laurels so I'm starting work on a small rack-top bag. That's an easy project; it'll be sized to fit our racks perfectly. We also want some small VO panniers that can be used front or rear. These should be just big enough for some extra clothes and gear for an inn-to-inn tour. Any ideas on the capacity you'd like? I'm thinking of panniers that are smaller than the Ostrich version, but a big larger than the Berthoud GB799. Thoughts? Ideas? The last photo is of some old French bars I've been riding with. I really like them and we're trying to have them reproduced. They are only about 42cm wide and have zero rise. I find them very comfortable and they look great. Speaking of bars, we have a big order in for more of the very popular VO/Nitto Montmarte and Left Bank bars, but no word yet on when they will arrive. 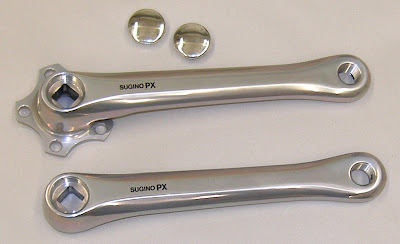 We just got some new-old-stock Sugino PX crankarms. These had been hiding in a corner of Sugino's warehouse for many years. When we asked Sugino about making more, they told us the molds had been discarded, but there were still a couple of cases of 175mm arms around. The Sugino PX was Sugino's version of the TA Cyclotouriste, or Pro-5-Vis crank. Like the TA it uses the great 50.4mm BCD. That means you can use all the TA chainrings, from 26t to 62t. It can be set up as a single, double, triple, or even as a quad. Unlike the TA, there is plenty of room between the arm and the outer chainring so you can use all the modern derailleurs with "shaped" outer cages and it's much easier to fit chain guard and chain cases. 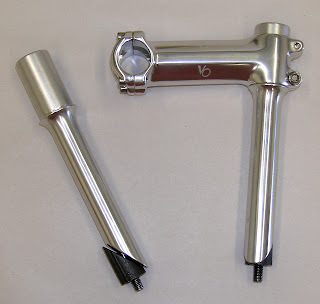 Best of all, the PX arms cost $145, versus $235 for the TA crankarms. 175mm only, JIS spindles (115-118mm for doubles and 120-121mm for triples. Regular British pedal threading. Also, we have double chain ring bolts for TA or PX cranks again. Some folks asked for a more rugged VO fender; perhaps they ride on rocky trails or leave their bikes outside on busy city streets. So our super popular 45mm smooth fenders is now available in polished stainless steel. Of course, the stainless steel fenders are heavier than our regular alloy model, but they are also far more dent resistant. And the highly polished finish looks great. The hardware is identical to that used in our other VO fenders and they are undrilled. We've also received many requests for a fender to fit 26" wheels. The new 26" VO fender is alloy, 60mm wide, undrilled, and comes with the usual VO hardware. We are also working on a new style of fender stay. This stay will bolt directly to the fender with two small button-head screws, instead of using eyelet bolts. 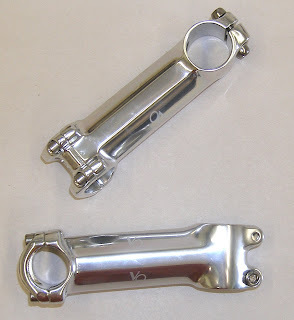 The rational is that it eliminates possible toe clip overlap on some frames. The tooling in now being made for these new stays and we should have them in a couple of months. Initially we'll have them as an option, but we may make them the standard stay on some models. The downside of this design is that it does not allow the stay to "swivel" when mounted in a less than optimal location. Also, all models of VO brand fenders are in stock again. Our entirely new model is the VO Course cage. It's based on the classic racing cage and also rendered in polished stainless steel. This cage will interest those who find the Retro cage too, well retro, and the Moderniste cage too daring. Some feel that this design allows the fastest bottle removal and replacement. Over the course of a 1200km brevet that could save you, perhaps, one second? Both the new cages work well with both metal and plastic bottles. Being stainless steel, they will not discolor plastic bottles. 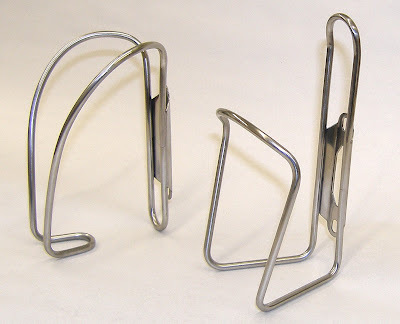 This completes the full line of Velo Orange water bottle cages. Or does it? We just got a shipment from Japan with a few items we've been out of for months. 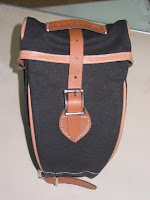 We once again have the very popular Ostrich handlebar bags, as well as Ostrich panniers and rain covers. We've also received Japanese sound bells. 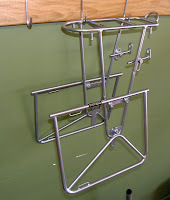 And we finally have Nitto Campee rear racks, but not the front. 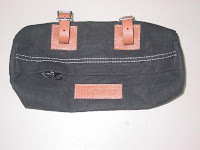 The two photos on the left are of the latest prototype of the Velo Orange bar bag. I think the quality and design are really nice. The production version will likely be black with brown trim. We hope to have them in stock in about three months. 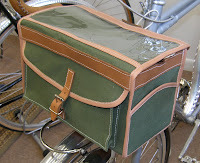 We will also have new versions of our other bags and perhaps small VO panniers. Velo Orange has moved into our new space. We used a local mover, Bill's Company, who was just great. Everything went smoothly. Extra shelves and file cabinets were delivered exactly on time by various companies. Our staff did a great job organizing the warehouse, while the showroom, that was my job, is still a mess. But we are not yet up and running and the blame sits squarely with Comcast. Let me explain. We were the first company in Annapolis to use Comcast commercial phone service. We also use them as our internet provider. About a month ago I called to arrange the service to be switched to our new location. I was assured everything would be taken care of promptly. Yet despite repeated calls to managers and supervisors all we've gotten is apologies and excuses. We still don't have phone or internet access at the new location. We now see why Comcast has been called, "The worst company ever." Read this article to see just how awful a reputation they have. I wish I'd known. What this means is that your orders will go out a day later than usual, some e-mails will go unanswered, and we'll be running home or to the library to get online or to print shipping labels. And you can't call us. This despite that our new space used to have Comcast service and all they had to do was send someone to hook it up again. I may write a more detailed account of all this later if anyone is interested. The photos are of our new space, except for the cake. That was a moving present from our postman. Thanks Ray! UPDATE: It's 8pm, but Comcast is finally here. We have internet service now and they say we'll soon have phones. Everything should be back to normal tomorrow.